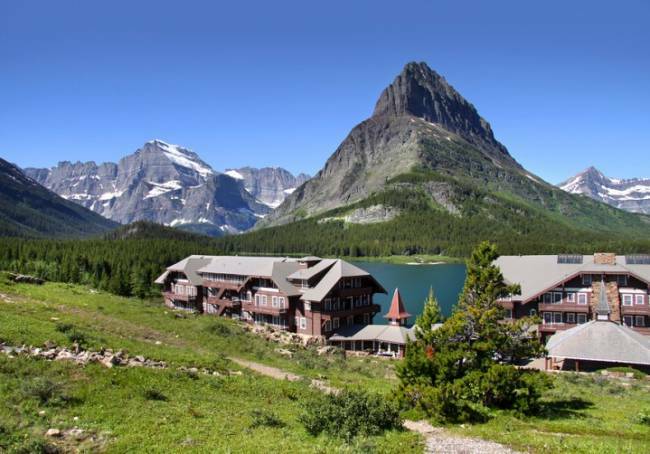 Many Glacier Hotel is located along the shores of Swiftcurrent Lake inside Glacier National Park. The Great Northern Railroad built this historic hotel in 1915 to accommodate the many tourists passing through Glacier National Park. This quaint hotel provides world-famous scenery, with panoramic views of nearby Grinnell Point and Mt. Henkel. These picturesque views and the warm hospitality of the staff at Many Glacier keeps visitors coming back year after year. Both of these spots are some of the park's best locations for taking pictures at sunrise and provide the ideal location for spotting mountain goats, bighorn sheep, and bears. A cozy sitting area in the massive lobby makes the perfect setting for fireside socializing, reading, and writing postcards. Many Glacier Hotel was built in 1914 and 1915 and is the largest hotel inside the park with 214 rooms. Its unique design was modeled after the Swiss chalets and the Swiss theme is carried throughout the hotel. 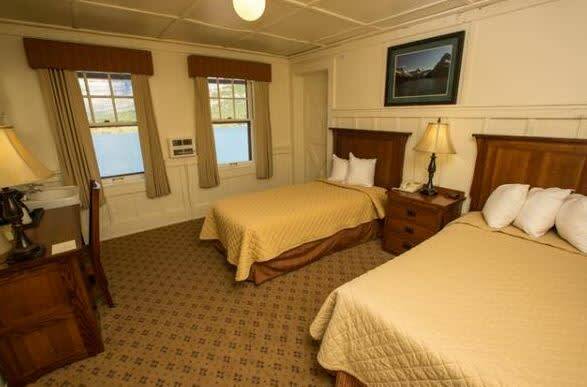 The Deluxe Lakeside Rooms have been recently refurbished with new paint, carpet, electrical and plumbing, and come complete with private bathroom, and either one king, or one queen bed. 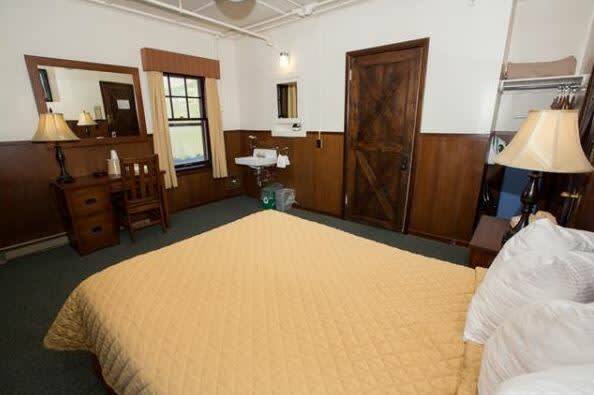 The Lakeside Rooms feature either one double, two twins, one double and one twin, or two double beds and a private bathroom. These rooms offer breathtaking views of the lake but do not have a balcony. The Parkside Rooms with a shared balcony feature either one double, two twins, one double and one twin, or two double beds and a private bathroom. These rooms have a shared balcony with limited views of the breathtaking surrounding landscape. Great for families needing additional space, these two room units are connected by a shared full bath and have bedding configurations of two doubles and one twin, one double and three twins, or two doubles and two twins. Each room comes complete with a private bathroom. These units are located on the 4th floor of the hotel and do not have elevator access. 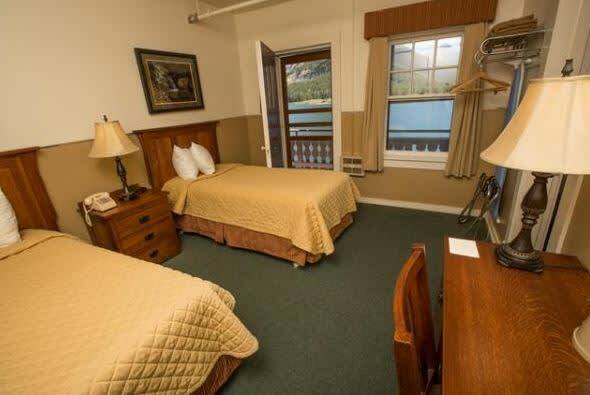 The Lakeside Rooms with a shared balcony offer lake views with the surrounding mountains in the distance. 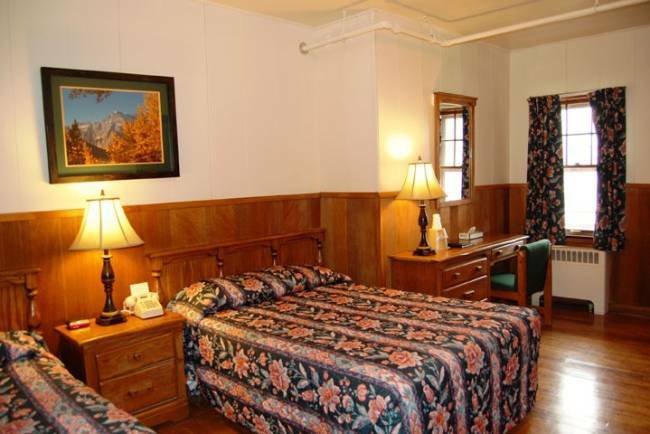 These rooms feature either one double, two twins, one double and one twin, or two double beds and a private bathroom. The Lakeside Rooms with shared balcony have been recently refurbished with upgraded furniture, wall decor, flooring, and window coverings. There is also new paint, carpet, electrical and plumbing. These rooms all have a private bathroom and bedding configurations of one king or one queen bed. These rooms have a shared balcony with awe-inspiring views of the lake. This Suite features one king and one double in a separate sleeping area, a non-working fireplace and a shared balcony. These rooms also offer two bathrooms, one with a shower and one with a claw foot tub. The Value Rooms are small and quaint rooms that feature either one double, two twins or one double and one twin, all of the value rooms feature a private bathroom. 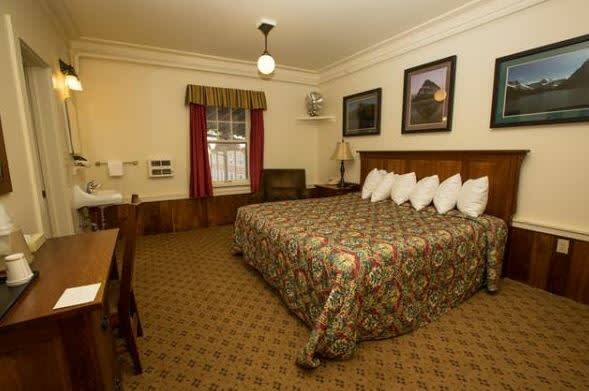 The Deluxe Parkside Rooms offer one king or one queen bed. They are located on the first, second, or third floor, accessible by stairs only. These rooms have been recently renovated and include upgraded furniture, new finishing, wall decor, flooring, and window coverings. All of these rooms have a 3/4 bath with shower only. These rooms do not offer views or a balcony. 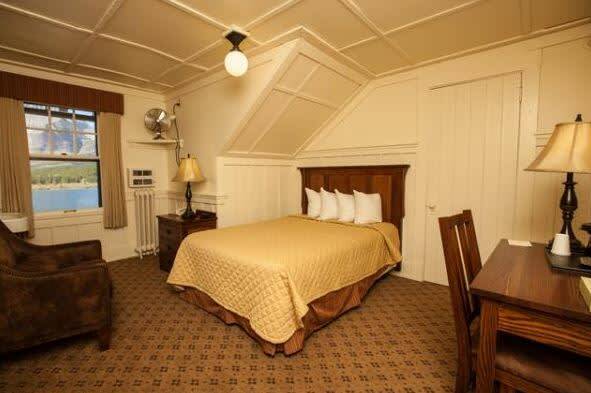 The Deluxe Parkside Rooms offer either one king or one queen bed. These rooms are located on the first, second, or third floor, and are accessible by stairs only. They have been recently renovated and include upgraded furniture, wall decor, flooring, and window coverings, and offer a 3/4 bath with shower only. Rooms also offer a shared balcony with limited seating. Rates Policy: Rates are based on double occupancy. Each additional guest age 12 or over is an additional $15.00 per night.